When we first bought our RV, even though it was older, we thought it was the coolest thing. That was until we hit the road and began staying in RV parks, usually surrounded by much larger, fancier rigs, oozing with style. During our evening campground strolls, we started to imagine ourselves in these rigs and took note of all the attributes that made them more desirable than ours. At times we even felt inferior and wanted more, assuming we’d be happier with something better. Truth is, our used Class C RV, is about as un-cool as it gets. It does not have slides, hydraulic doohickeys, hip retro styling, satellite TV, Corian counters, or full body paint with swoosh graphics. There are no RV groups or cult followings dedicated to generic Class C RVs that are past their prime. Nor are we approached with compliments or curiosity about our rig. Even though it is 24 feet long and nearly eleven feet high, it might as well be invisible. But what it does have, it excels at: It is paid for, and has proven to be tremendously practical. I recall being told many years ago that no car is better than the one that is paid for. This can be applied to just about anything, as debt, at least in my mind, is like indentured servitude. RVs can be financed for 15 years, which is a long time and not enviable. Having our RV paid off, allows us to have this adventure and worry less about money. One of the principles to happiness is to spend money on experiences, not stuff. Learning to live simply has been one of the greatest benefits from this journey. 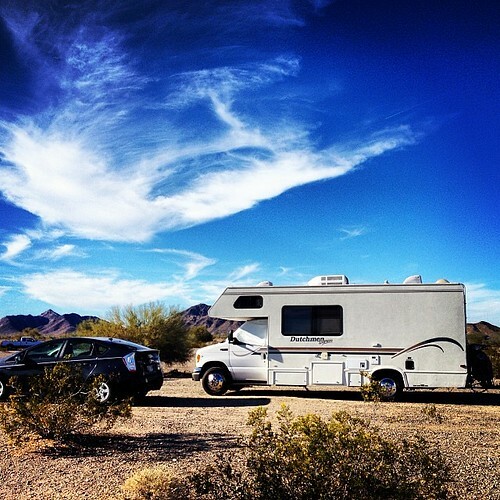 There are advantages and disadvantages to all RVs. We spent a couple of months looking, had basic criteria, and eventually found one that did not completely aesthetically assault our senses and felt right. We have become more accustomed to trusting our gut, and realize this type of knowing often trumps our best laid plans. After fulltime RVing for about 9 months, the desire for something more reached a crescendo. After searching online and browsing RV lots, we realized something: That our current RV, the Dutchie, was cozy and we have been content. The wanting was not because something was lacking, but based purely in desire. Being aware of this, our searching for something else ceased. We both knew that being grateful for what we have is another key to being happy, and we have a lot to be grateful for. 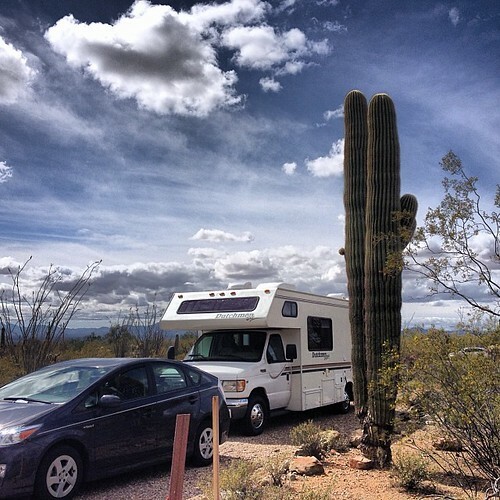 This entry was posted in Musings, RV Lifestyle and tagged Being Grateful, Being Happy with current RV, Best Class C RV, Best RV for fulltimers, Best RV is paid for, Cool RV, Living Small, paying cash for an RV, RV Envy, Tiny Living, Top Fulltime RV Blog on August 11, 2014 by The RV Nomads. That is what it is all about. Simplicity in living. You both definitely have the right attitude. I always have thought the fancier and high tech it is, the more problems you can have and a bigger expense in fixing it. Plus the bigger space allows you to collect more “stuff” Stay on this path. I envy your freedom and happiness in simple living. Excellent article, I could not be more true. Our RV is paid for as well, but we (or I guess more specifically I) have spent alot of time checking out all the “better” rigs. We have not even hit the road yet, we will be full-time starting Labor Day, but your post I have taken to heart! It is ALWAYS good to be reminded to be thankful for what we have and not just chase the next “better” thing. See ya on the road! Well written and good philosophy on life. This entry is another example of why I enjoy your RV blog over others: It’s more than a mundane log of where you’ve been, the flowers you’ve seen, and the food you’ve eaten. It tackles morals and searches for the root of meaning, and gets beyond the superficial nature of many blogs. We currently have a home converted van and are part-timers. Our goal for full timing is your rig. Looks PERFECT! Well loved ’97 Class C, bought and paid for. No debt. No stress. 24′ of comfort. You have the exact right attitude. I don’t stay in RV parks much, mostly State and National campgrounds, and my shortie is just perfect for such great places.